PC Optimizer PRO is a rogue optimization software program and once it gets installed on your computer, it claims that errors and junk files are found on your computer and you must buy the full version of the program in order to clean them. If your computer is infected with PC Optimizer PRO, you must ignore all fake warning messages and DO NOT give any money to purchase the full version of the program. PC Optimizer PRO program looks legitimate, but the scanning results are fake and upon its installation, it may disable your antivirus program and compromise your computer security. If a computer is infected with “PC Optimizer PRO” ransomware, then more FAKE security warning messages and pop-up ads are displayed on the victim’s computer screen and the computer speed is slowed down due to the malicious program running on the background. PC Optimizer PRO scareware can download and install additional malicious programs to the infected computer that can damage your Operating System or steal your private information. Ransomware programs like this, may contain malware (malicious software) in their code in order to compromise the computer security and make it vulnerable to hackers or malicious Internet attacks. Technically “PC Optimizer PRO” is not a virus and is categorized as a malware program (“Potentially Unwanted Program (PUP)” that may contain and install malicious programs on your computer, like adware, toolbars or viruses. How to get rid of PC Optimizer PRO Rogue software. Step 1: Terminate “PC Optimizer PRO” running process. 1. Press simultaneously the "Ctrl + Shift + Esc" keys on your keyboard. 2. At “Processes” tab, select the “PCOptimizerPro.exe” process and click the “End Process” button. Step 2. 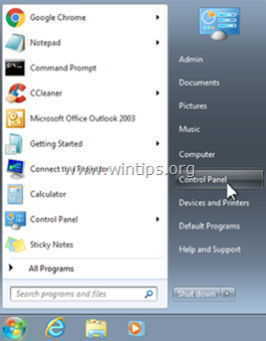 Uninstall "PC Optimizer PRO” from your Control panel. 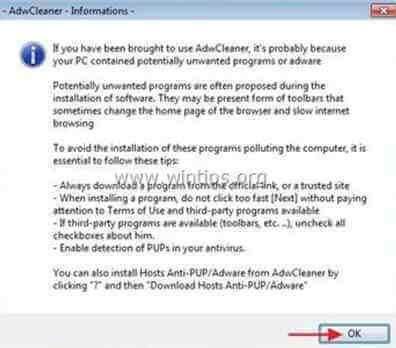 Step 3: Remove PC Optimizer PRO with AdwCleaner. Step 4. Remove PC Optimizer PRO with Malwarebytes Anti-Malware Free. 4. When the scan has completed,press the “Quarantine All” button to remove all threats. Step 5. Clean unwanted files and entries.